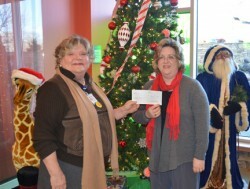 Proceeds from one of Milligan College’s two Christmas concerts were presented to Niswonger Children’s Hospital. Cookie McKinney (left) accepts the donation from Dr. Kellie Brown, chair of Milligan’s music area. Additional proceeds will benefit Milligan’s music area. MILLIGAN COLLEGE, TN (Dec. 20, 2013) — Milligan College’s annual community Christmas concerts drew record attendance and donations totaling more than $6,500 to benefit Milligan’s music area and Niswonger Children’s Hospital in Johnson City, Tenn. The annual Christmas concert is free, but donations are collected to benefit a different non-profit organization in the community each year as well as the college’s music program. This year, proceeds from the first evening, $3,942, went to the Milligan music area, while offerings from the second evening, totaling $2,851, were donated to Niswonger. “We are thankful for the generosity of our audiences and for their support of Milligan’s music area and the good work of Niswonger Children’s Hospital,” Brown said. Milligan’s music area offers a wide range of choral and instrumental ensembles including the Concert Choir, Jazz Ensemble, Milligan College Orchestra, Women’s Chorale, and Heritage and Heard Mentality a cappella groups. The Christmas concert is a rare opportunity for these groups to perform together and showcase the variety of talents within the department. Niswonger Children’s Hospital serves more than 200,000 children in a four-state, 29-county region. It is home to one of only six St. Jude Affiliate Clinics. The 69-bed children’s hospital is staffed by pediatric experts who know, love and care about children and their families. Last week, Brown presented Niswonger’s portion of the proceeds to Cookie McKinney, manager of children’s initiatives for the hospital foundation. The hospital plans to apply the donation to its spring radiothon, which helps fund much-needed, specialized equipment. To learn more about Niswonger, visit www.msha.com. For more information about Milligan’s music area, visit www.milligan.edu. Posted by Milligan College on December 20, 2013.